Byttow Woodworking creates luxurious finishes for its custom, high-end cabinets. Shop Size: 9,000 sq. ft.
FYI: The original Byttow company, specializing in home remodeling, was started in 1929 by Mark Byttow's grandfather, Steve Byttow. It's not about how you start, it's how you end, and for the custom woodworker, ending with a flawless finish is the perfect way to complete a project. Although fabrication techniques illustrate the structural integrity of a cabinet, its finish makes the first impression. With that thought in mind, Mark Byttow of Byttow Woodworking, Steger, IL, concentrates on the finish. 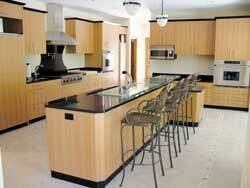 Byttow Woodworking fabricates high-end residential kitchens with custom veneers and high-end finishes. "I've always been focused on the finish because it's the first thing a customer sees," he says. "[The cabinet] must be built right, which is key, but the finish is very important." Byttow believes the sophisticated finish of his company's projects plus, quality craftsmanship from generations of family experience, distinguish Byttow Woodworking from the field. Byttow says he and his father, Norman Byttow, started out as general contractors building custom room additions for homes. After realizing they needed trim and millwork, the Byttows started Byttow Woodworking. Years earlier, Norman had joined his father, Steve Byttow, in the home remodeling business and formed Byttow & Son. "We needed trim, doors and cabinetry for our room additions," Mark Byttow says. "They had to match the existing home." Along with the trim and millwork the finish had to match as well. Byttow says his experience and special attention to finishing comes from painting cars. "I was always into the finishing aspects," he notes. "Using automotive finishes helped [me] in finishing cabinets." Achieving a good finish takes preparation, Byttow says. It requires a lot of hand sanding, and it also requires a good finisher. The contemporary kitchen above was fabricated with larch veneer and lightly stained with grey opaque polyurethane. Byttow says he has been finishing for approximately 30 years. His techniques are honed by experience. "You learn by your mistakes," he says. "I was doing all the finishing pretty much until we moved here (Steger)." According to Byttow, finding a good finisher is difficult. One of the main qualities he looks for in a finisher is consistency. "We look for someone who can apply the finish consistently," he says. Since the finisher is usually the one doing the sanding, they have to do the prep work the same throughout the entire job. They should follow the same grit sequence in sanding and apply the same amount of sealers and top coats, Byttow says. "It's almost an art form. You have to have an eye for color and also application as far as applying the finish. [And you need] a steady hand," he says. Having an eye for the color is also a benefit when the company has to match an existing finish, or create one from scratch based on what the customer has envisioned. Aiding in that effort is Byttow's gram scale. "We are able to mix our own stains and reproduce it in larger quantities [now or at some point] down the road because of precise measuring with the gram scale," Byttow says. As an example, Byttow says that a customer wanted his kitchen island to be blue with a wood tone on the perimeter cabinets. "They wanted the blue to match jeans, like a denim type of worn look," he says. "So the island was done in a blue finish and the primary cabinetry was done in a lighter wood tone glaze." Byttow uses ICA's line of urethane and polyurethane finishes. He also uses Hesse products. "We use [Hesse] water-based stains and are starting to use their finishes too," he adds. Byttow says his finishing techniques are pretty much standard. But his experience in automotive finishing allows him to add a few tweaks. For high-gloss finishes using ICA polyurethanes, he has developed some new techniques. "If [the customer] wanted a blue finish, for instance, we would prime and sand the doors, then apply the blue paint," Byttow says. "Then that same day we would clear coat it with the same company's clear coat so that when you're wet sanding the product after three days, you're sanding clear coat rather than blue finish. Once [it] has been sanded, we put two to three more coats of clear coat over that and do a final sand rub-and-buff and bring [it] to a high-gloss finish with automotive compounds." Quartered anigre veneer and a clear urethane finish were used to fabricate this modern kitchen, which also features a high-gloss black crown moulding. With this technique, rather than sanding the blue finish and getting blue dust, which can be messy, Byttow says, only the clear coating is being sanded. Byttow talked to the coatings supplier who assured him the process was fine as long as it was done the same day with the same product. "The technique is something we wanted to try," he says. "I don't think a lot of people do a lot of opaque work like that. But they would probably benefit from it if they were doing high-gloss finishes with opaque colors." Another key to achieving a good finish is having the right set up. And to that end, Byttow has invested significantly in wood working equipment. 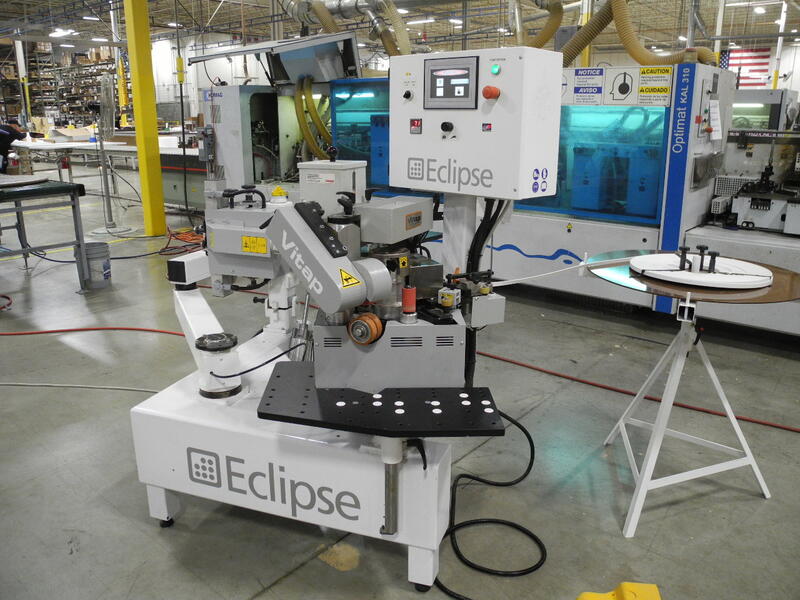 A large portion of the 9,000 square foot shop is devoted to the finishing area, which consists of a downdraft table, an enclosed automotive spray booth from Ameri-Cure Inc., an area for creating and matching colors, and a section for the finishing racks and spray guns. All of the finishing racks were created in-house on the company's CNC machine. "We needed a lot of racks, and we wanted the sticks to be removable so if we have a deeper part we're able to put a longer stick in to hold [those] parts," Byttow says. For the large amount of finishing Byttow does, the company uses HVLP spray guns from Binks and Iwata. "They save on material and give you a nice finish," Byttow says. A Kremlin air-assisted airless system is used for larger panels or when there is a lot of product in the spray booth. Byttow says glaze is sprayed on rather than using a brush. "It saves a lot of time when you spray it on and use a brush to strike it out," he says. "Use rags to remove it from areas where you don't want it. Spraying glazes is more efficient. So is spraying stains." All water-based stains are also sprayed and wiped, Byttow says. "The quality has to be there, but time is where you can really save money and labor." For its custom cabinetry, Byttow Woodworking uses a wide range of natural veneers, including sapele, khaya, maple, larch and cherry. The company also uses pre-dyed veneers because the color is already in the wood, and it provides consistency, Byttow says. "The pre-dyed veneers are nice because all you're doing is sealing and clear coating," Byttow adds. Byttow Woodworking's shop floor is filled with what Byttow calls "state-of-the-art" machinery, which includes: a Holz-Her vertical panel saw, an Altendorf sliding table saw, a Holz-Her edgebander, a Timesavers widebelt sander and a Biesse Rover 321 Elite point-to-point boring machine. All of which run in an efficient system, Byttow says. 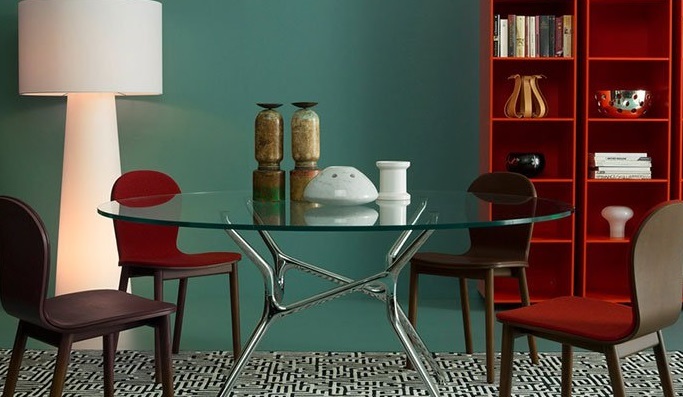 The high-end salon shown below features an opaque white polyurethane finish. "We have everything in place we need to produce the products and the kitchens that we are doing right now. It took almost eight years to put all these machines in place - the conveyors, the system and flow." The system was developed by trial-and-error, Byttow says, "You learn a lot through reading trade magazines and looking at how other companies are set up," he notes. In the milling area, panels are cut to size and then sent to the edgebander. After the parts are edgebanded, they are sent to the end of the conveyor to the CNC machining center where they are machined for hardware and dowels. Flat panels and cabinet parts are moved to the case clamp area where hardware and accessories, such as Grass Nova drawer slides, Blum hinges and H+ÃÆÃÆÃâÃÂ±fele hardware, are installed. Then dowels are put in and the cabinet is placed in a case clamp. From there, it is sent to the finishing department. 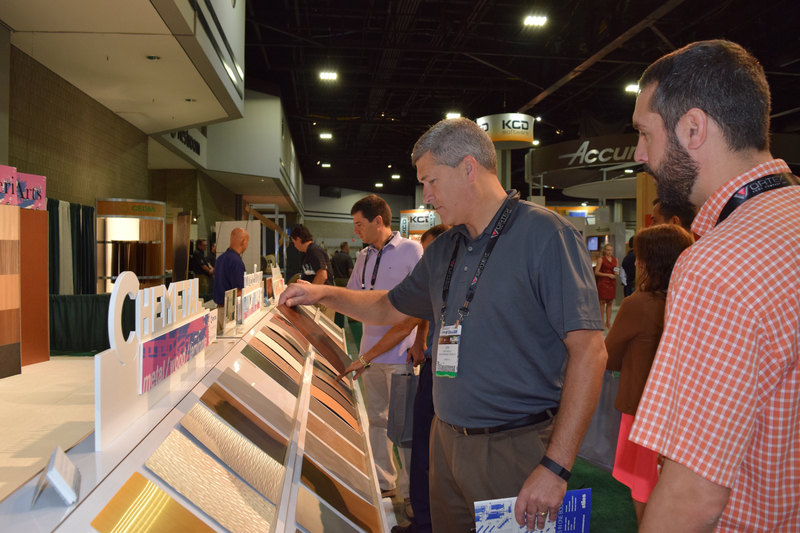 According to Byttow, gloss and flat finishing are popular finishing trends right now. The contemporary look - mixing veneers, painted surfaces and stainless steel appliances - is also popular. Byttow Woodworking is currently a five-man shop. Mark Byttow, Nick McDonald and Jesus Martinez handle construction and finishing, and Norm Byttow and Hank Reus oversee installation. Byttow says he hopes to grow the company and produce more work. "We would like to be an eight-to-10 man shop producing high-end kitchens, and known for top-quality work with great finishes."